When squashes are in full season, we are dining with them every week. We adore a slow cooker butternut squash and apple soup when the days are short and cold, and butternut fries when we are hankering for something a little bit crispy and covered with beautiful flakes of sea salt. A pan of that sounds good right about now! 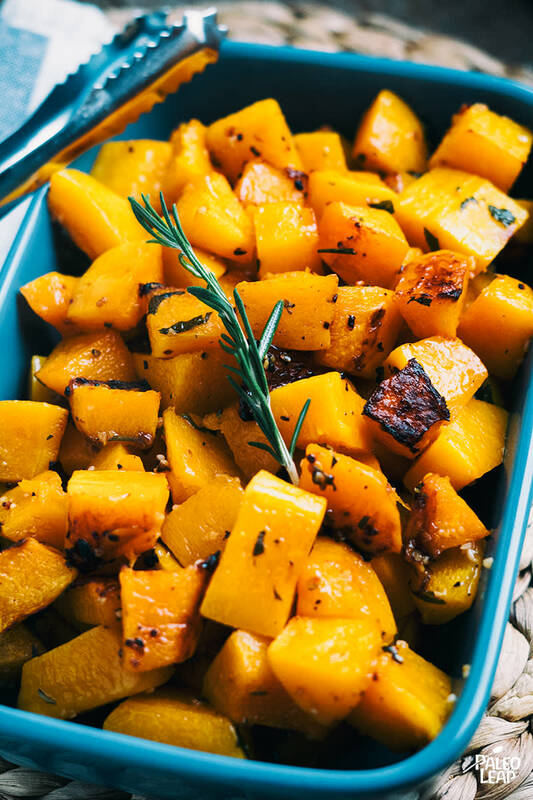 Today we are going another route and roasting cubes of squash with fresh parsley, rosemary and thyme, because this squash recipe is amazing too. It is naturally Paleo, vegan and gluten-free, so if you are cooking for others, it is a good bet when you aren’t sure about the dietary restrictions of your guests. It is just as fit for a holiday meal, as it is for a weeknight side dish, and the opportunities to dress it up, or down, are endless. Simply seasoned with salt and pepper? Delightfully sweet. Adding a touch of sage and pine nuts? Scrumptiously savory. Served next to a roast duck with herb ghee? Flavorful beyond imagination. Of course, there is no need to go over the top to impress your family. Chances are wonderful that they will enjoy a tasty portion of simple slow cooker chicken as well, served right alongside these roasted bites of squash. Toss in a green salad with a homemade dressing and all the praise will be yours to keep. In a bowl combine all the ingredients, and season to taste. Gently toss everything until well coated. Place the squash on a parchment lined, or lightly oiled baking sheet. Roast in the oven 35 to 40 minutes, turning at the halfway point. Adjust seasoning and serve topped with more fresh herbs, if desired.